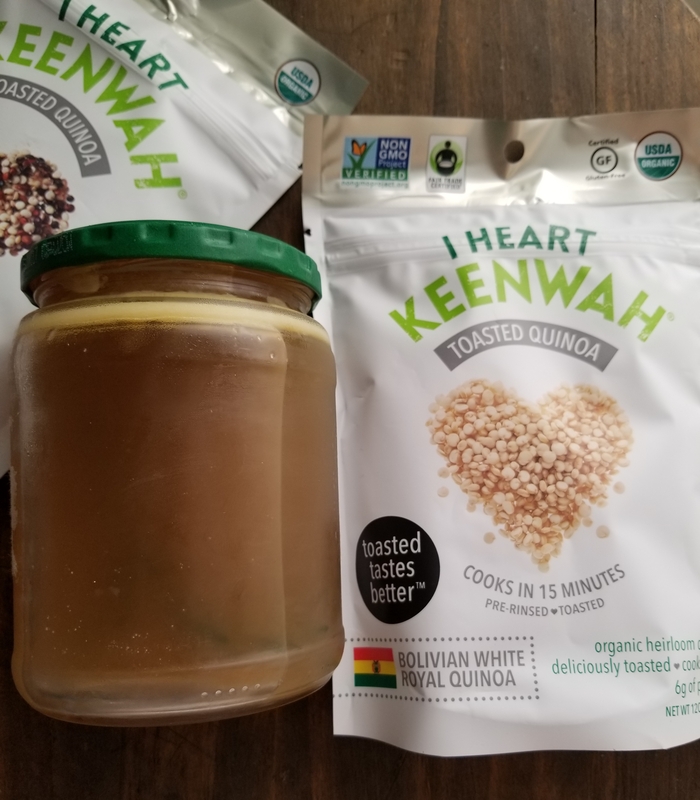 I Heart Keenwah is a new quinoa I was introduced to at Expo East. Their toasted quinoa claims “toasted tastes better” & I was eager to see how true that was. 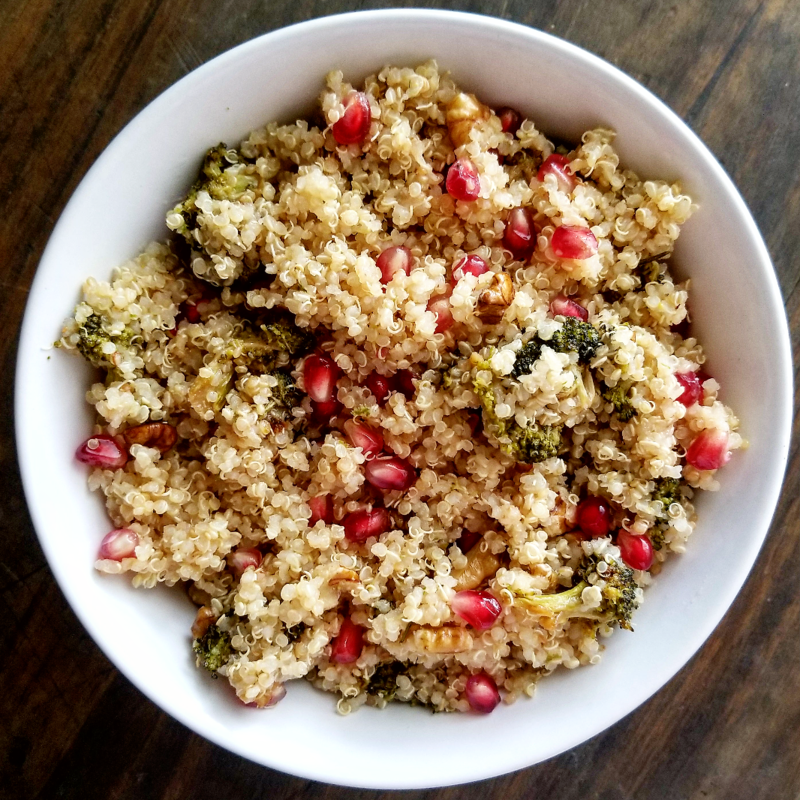 Though pre-cooked quinoa is easy, this one definitely packs more flavor! So, first things first, I cooked the quinoa in homemade chicken stock instead of water. If you want to know what I did, that step is here: Homemade Chicken Stock in Slow Cooker. If not, let’s skip ahead for the quinoa! 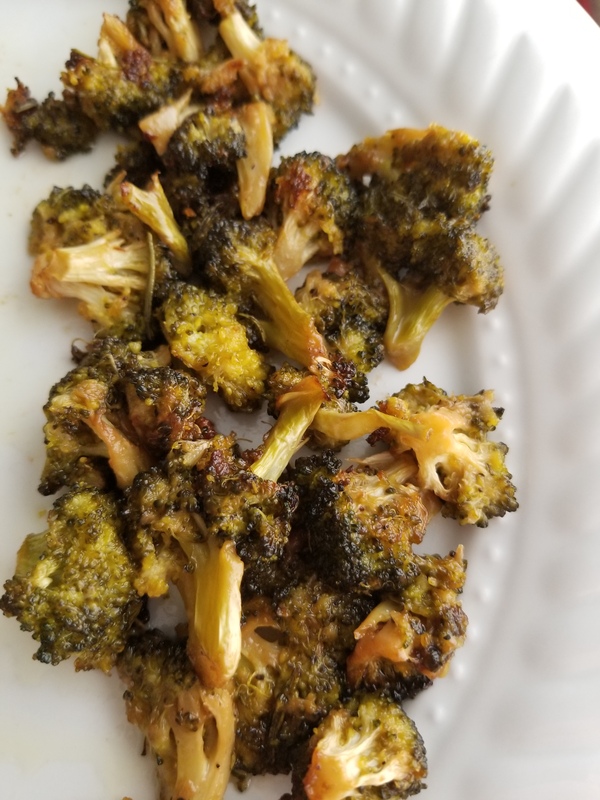 Roast broccoli at 425 for 20 minutes. Let broccoli sit while quinoa is cooking. Combine quinoa & chicken stock in medium pot & bring to boil. Cover & lower heat. Simmer for 15 minutes. Once quinoa is done, I added the lime juice, zest, some pink Himalayan salt & stirred. Then I let it sit for about 5-8 minutes. Added pomegranate after it cooled for a bit. Then broccoli & walnuts right before serving, stirring to incorporate. 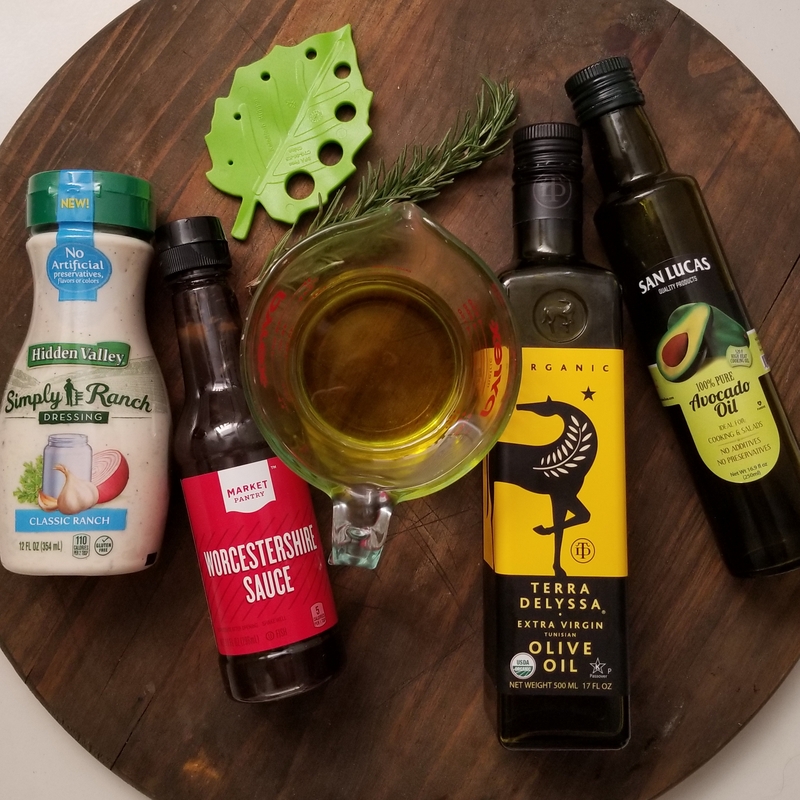 There’s a rosemary ranch marinade I love on chicken. As I made it for the chicken, I made sure to save some for the broccoli as well. 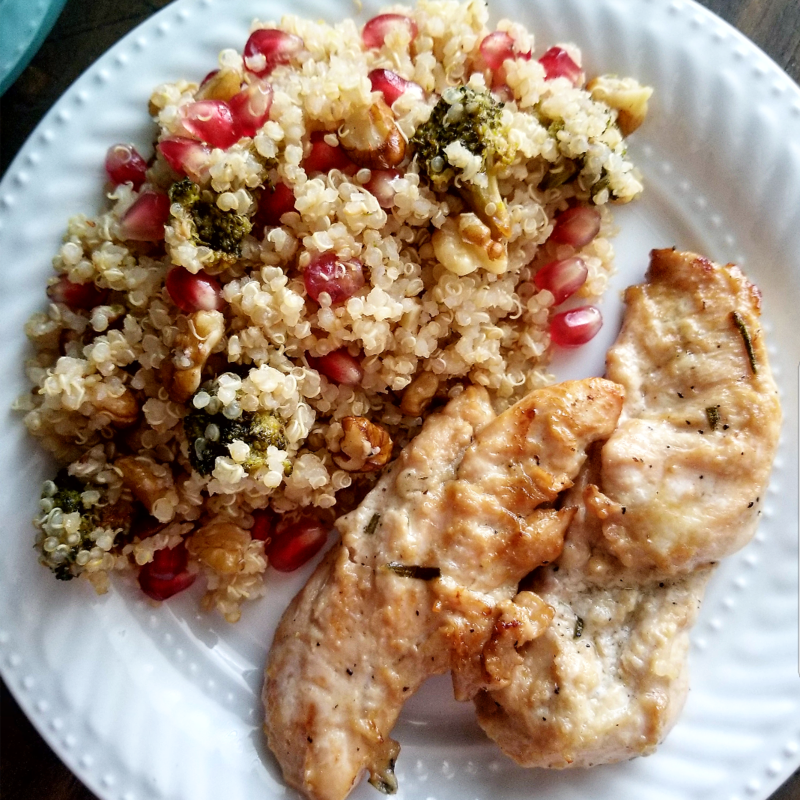 I’ve seen this recipe in multiple places but can’t seem to find the original source to credit. But I also made a few edits to it, so here we go! Whisk all together & pour over 1 lb. of chicken. Use remaining marinade to dress broccoli without contamination. Marinate chicken from 6 to 24 hours. As for the broccoli, I marinated for 2 hours. Again, roast broccoli at 425 for 20 minutes. 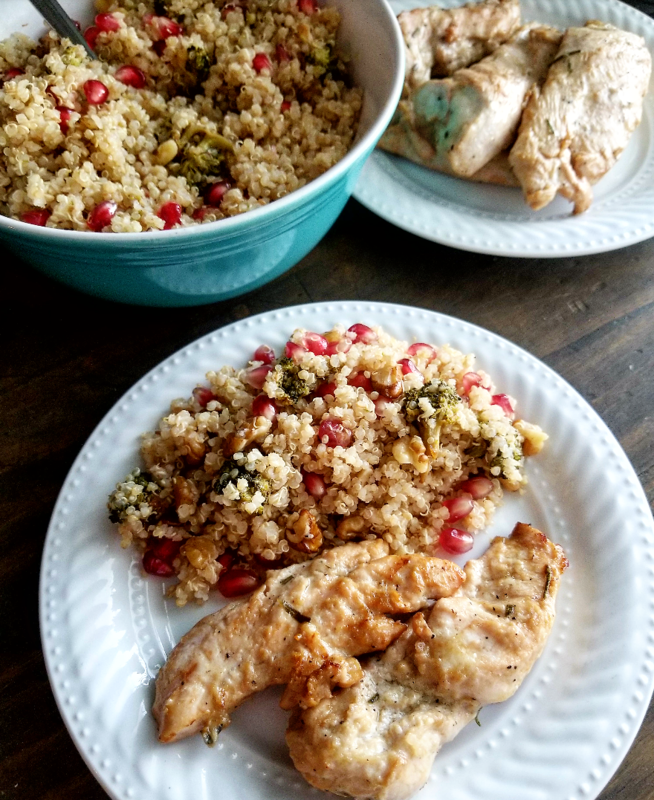 Grill chicken or cook via stovetop on cast iron grill & finish in oven at 350 for 15 minutes, or until done, depending on size of pieces & how long it was cooked on stovetop first.